Recap: Mashima is in the zone as he makes his way to the B-Class finals against the talented Rion. At the same time, Arata and Shinobu are duking it out in the A-Class finals. Who should Chihaya watch? 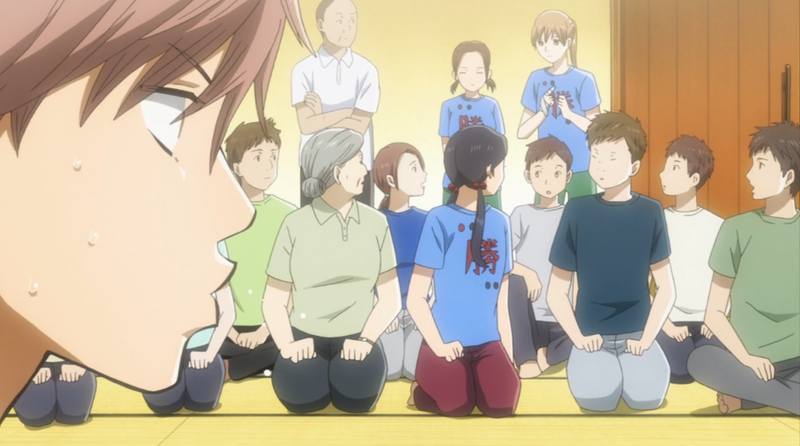 Torn between watching her role model and rival or Taichi, Chihaya really was in a tough spot. Nishida has no reservations: Arata may well be a future Master, and Shinobu is Queen. You’d be insane to miss this kind of opportunity. I can definitely agree with his logic, but I’m so glad to see Chihaya to choose her friends first. The best part was Taichi’s reaction to her come in, and how that seemed to pretty much throw him off his game. For as long as he’s known her, you’d think he’d know to expect her to be capable of anything by now. They sure are rocketing through the story now. I suppose with the Arata-Shinobu matchup, they couldn’t spend too much time on Taichi, but even for that this seemed like a brief match. Considering Rion was such a huge threat in the finals match, that made the brutal quickness of the match that much more striking. That doesn’t mean it wasn’t exciting, though. I imagine Komano’s match is in the same room, but we haven’t seen a bit of it. I hope that changes next episode, as it’s no secret Komano is my fan-favorite. Still, now that Taichi’s match is over, it looks like the real marquee is going to stay with Arata and Shinobu. I’m honestly less excited for this than any match we’ve seen yet. The fun thing about watching Team Mizusawa is that they aren’t the best. They struggle, they make mistakes. The best part is watching them grow. With these two, we just have these players of assumed prowess in a match so fast even the in-cast audience can’t keep track of it. We didn’t even get to see Arata outside of that stupid part with him entering the team tournament, despite him still being treated like a main character the whole way through. I’m suspecting there’s going to be some kind of “Power of Friendship” thing going on this match considering what happened to Arata throughout the tournament arc, so I suppose it’s as much about the war of ideals as it is the war on the tatami. I definitely agree, Mizusawa are show to not be the top players but their tenacity and character is what makes them so fun to watch. 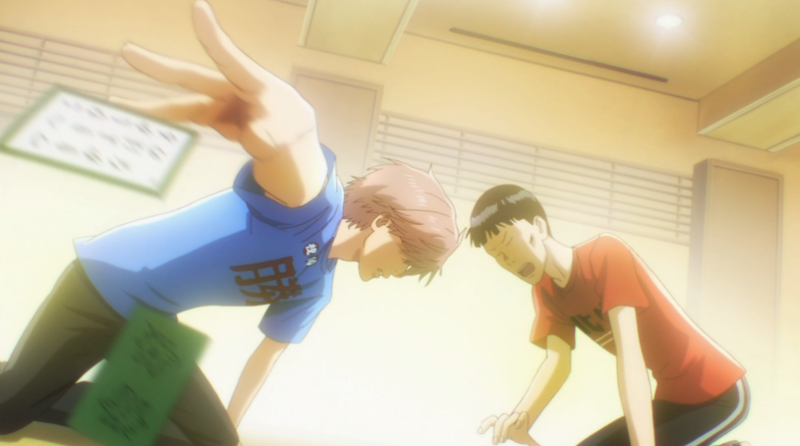 In this episode, it was frustrating seeing Taichi put himself down like that and rushing match but it really added to his character and built up nicely to the crying scene. I’m loving Taichi more and more.